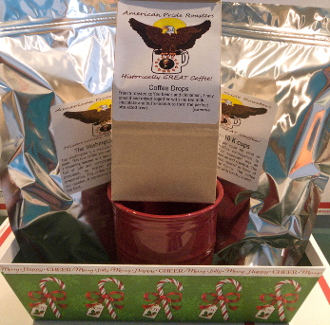 A gift basket for Keurig brewers- just in time for Christmas!!! One bag of 10 Roosevelt k-cups, one bag of 10 Franklin k-cups, a bag of delicious Coffee Drops and a coffee mug. All Gift Basket orders will ship around or just before December 15th to insure delivery by Christmas. *We will probably get a bit creative in how we purchase the mugs and gift trays. The gift basket and mug will likely be a different color and shape than what is in the photo. We will try to keep the site updated with a current view of the entire gift package.